"I have been very impressed with how much better our trees look this season since you deep root fed them this spring." Get 50% off your next treatment when you refer a friend who signs up for our lawn care program! Mild winters are one of the many benefits of living in Central Texas. Bryan-College Station is a great place to live and work, and raising a family here means we can get our kids outside much more during the winter than we could if we lived in many other parts of the country (I’m looking at you, Chicago). While the majority of the country spends most of the winter covered in snow and shivering through well below freezing temperatures, Texans scorn the idea of being cooped up all winter long. But a big part of the kids being able to play outside all year long is having a nice lawn for them to play on. That’s where professional lawn care services from Aggieland Green — your Top Rated Local® local lawn care company — can help. Mild winters make caring for Texas lawns a 12-month cycle. Warmer climates are unique in that winter weeds take over the landscape quickly if left untreated. 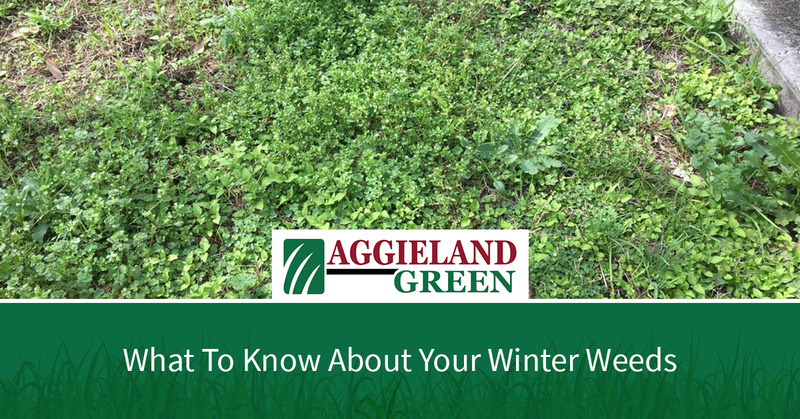 Winter weeds — such as Clover, Henbit, Chickweed, Thistle, and several others — germinate in late September and October and continue to grow through the entire winter if left unchecked. By February, winter weeds take over the entire Brazos Valley. They continue to grow larger until around April or May when they set seed. These seeds lay dormant in the ground until the following Fall, when they germinate and start the process all over again. Excessive rain between this past fall and this winter has encouraged a lot more winter weed germination this year, and we are seeing the emergence of more winter weeds than we’ve encountered in several years. Winter weeds growing in your home lawn stick out like a sore thumb. Our customers expect their lawn to look well-kept and neat during the winter and spring months, and quite frankly, we expect the same thing for people using our lawn care services. Our lawn care program — which is specifically tailored to the unique climate of Central Texas and the Brazos Valley — attacks winter weeds before they start with a fall pre-emergent treatment that kills weeds as they attempt to germinate. In January and February, we return to treat your lawn again, as the pre-emergent is wearing off and weeds can begin to return. If for any reason you end up with a couple of sprouting weeds between treatments, just give our local lawn care services team a call and we will make a complimentary stop by your home to get them taken care of. Winter weeds in lawns in Bryan/College Station are common, but they aren’t something homeowners have to live with. We have the formula that encourages the grass to emerge from winter dormancy healthy and green, free from the competition and eyesore of weeds. If you haven’t been happy with the results of handling your lawn care yourself or your current lawn company just isn’t cutting it, give Aggieland Green a try — we promise you a healthy, weed-free lawn all year-long.